Daily Spirit & Word: 776: Who’s that knocking at my door. Good morning friends, I was awakened by a strange noise in the house this morning at 4.30am. It startled me out of a weird dream. In the dream I was back in Plymouth and some kind of strange earthquake was happening, I saw a bus falling over on it’s side and buildings shaking and some falling to the ground. People had their mobile phones out taking pictures to capture the scene and share on social media. Do you know what that noise was that woke me? It was a knocking at my door, but when I got to the door there was no one there. I was up now so decided to read some of God’s Word and this is what I read. If “faith comes by hearing the message, and the message is heard through the word of Christ” then why didn’t the Israelites respond? Who knows, but they didn’t. When someone is knocking at your door what do you do? Do you sit there and ignore it? Do you get up and listen at the door to what they have to say? Do you open the door to the one with the message? My friends, those Israelites didn’t open the doors of their hearts to God. He called upon them many times and in so many different ways. They might have been there listening to the message, but they didn’t respond. God is also holding out his holy hands to you today. He’s calling you with the Good News of Jesus; “Come to me” said Jesus. When we hear the Good News and don’t respond, it’s like knowing someone is at the door with a message that is so important for us, but we’ve got to open the door to respond to that message. It’s no good knowing Jesus can save you, if you don’t respond in faith and receive Him as your Lord and Saviour. It’s no good knowing Jesus died for sin, if you don’t trust in Him and His death on the cross was for your sins. It’s no good knowing Jesus was raised from the dead and believing it all to be true, if you will not repent of your sins and receive Him into your life. 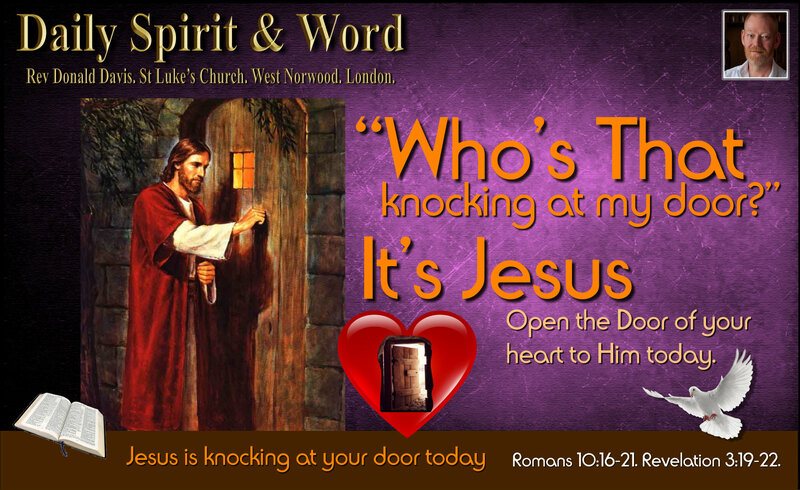 He’s knocking every day, but have you opened up the door of your heart to Jesus? Jesus is knocking my friends, so open up the door of your heart afresh today. If there’s something in your life at this moment more precious to you than Jesus, you need to let go of it, because there’s NOTHING, nothing, absolutely nothing, that’s more important than your eternal welfare. Once you open that door to Jesus, then and only then, will all His promises be yours: Abundant life (John 10:10), New Birth (John 1:12, 3:1-22). It’s Jesus Christ: Open the door of your heart to Him today: Be earnest (sincere, heartfelt, solemn, clear,) and repent: Turn from living your life your way and begin to walk in the power of the Holy Spirit by turning to Jesus for forgiveness, cleansing and new life. Amen!